The secret behind this capability is enhanced session mode use Remote Desktop Connection session via the virtual machines bus (VMBus) thus not needing network connection to the virtual machine. Good news is this feature already enabled by default in Client HYPER-V (windows 8.1) but not in the Windows Server 2012 R2. 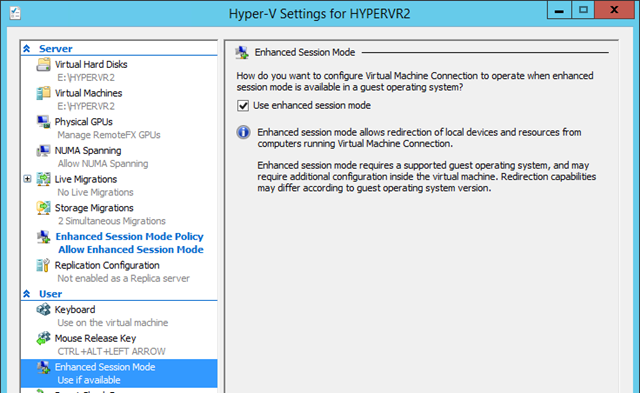 But no big worries you can enable that feature very quickly by going to to the HYPER-V settings in the MMC console. An enhanced session mode connection has been requested by the Virtual Machine Connection tool. The VM is running an operating system which supports enhanced session mode. The Remote Desktop Service is running in the virtual machine. So when can this Enhanced Session can be useful? Enhanced session mode allows you to redirect local resources to the a virtual machine in the same way as you can with Remote Desktop Connection, but you do not need network connection to the virtual machine. 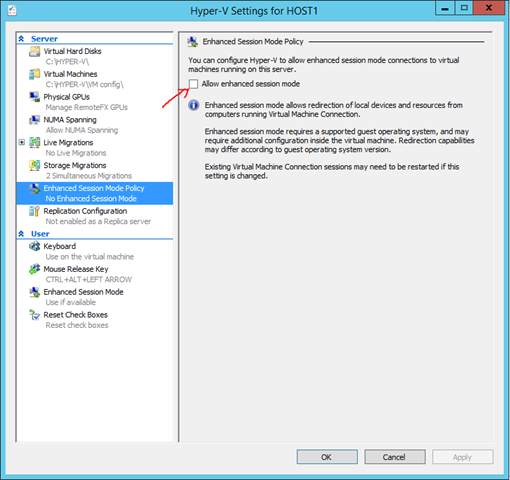 You only need to be able to connect to the server running Hyper-V where the virtual machine is running. Troubleshooting a virtual machine without the need for a network connection to the virtual machine. Developers can now fully test and troubleshoot applications running in a virtual machine that require USB and sound redirection without the need to use Remote Desktop Connection.